The classic fruit machine gets a blast of sunshine in the explosive Inferno Star. Created by Play ’N Go, it’s a 5 reel, 5 payline fruity that comes with re-spins where special scatter symbols can deliver massive rewards of up to 2,500 times your total bet. Play on all devices from between 5p and £100 per spin. Play ’N Go has kept things simple in Inferno Star. That’s true of both the design and the gameplay. With the fiery sun in the background the reels have the look of an old school fruit machine. You’ll see grapes, lemons, plums and apples. Land 3, 4 or 5 of these and you’ll get a payout of 3, 9 or 25 times your total bet (the grapes also pay 1x if you land 2 of them). More rewarding are the cherries and melons which award 9, 25 or 75 times your total bet. The standard sun symbol follows, delivering 25, 75 or 500 times your stake for a 3, 4 or 5 symbol combination. Those awards can get even bigger if you manage to trigger the game’s only extra. Raging Sun Re-Spins feature – this can activate if the raging sun scatter hits on the middle reel. That reel is held and the other spin again. If a raging sun scatter hits anywhere else on the reels it too is held and another re-spin follows. These keep on coming as long as a new raging sun scatter arrives. These raging sun scatters can deliver some mighty impressive awards too. Land 3, 4 or 5 of them and you’ll win a payout equal to some 125, 375 or 2,500 times your total bet! These scatter payouts come in addition to the payouts from any standard symbol combinations that might hit during the re-spins. That’s it as far as gameplay goes. The only extra is the Raging Sun Re-Spins feature. We found it to be really hit and miss. Expect to totally whiff on many occasions. 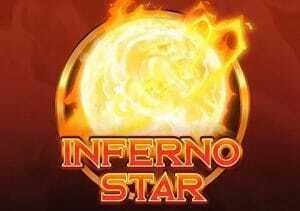 Get lucky with those re-spins though and the Inferno Star can deliver some scorching hot action. We’d put the variance in the high range. The simple gameplay won’t be to all tastes. If you fancy playing a simple fruity that can still pack a big potential payout punch, then Inferno Star could be one for you. I suggest you take a look at other Play ‘N Go video slots with Gunslinger: Reloaded and Viking Runecraft amongst my favourites.